If hang gliding into the ocean sounds like fun, PilotWings Resort is for you! PilotWings Resort uncovers the hidden dark side of Wuhu Island, the location seen in other Nintendo titles such as Wii Sports Resort. Its mountains are covered in crashed airplane debris. The ocean floor is littered with the bodies of hang gliding Miis. The avian population is constantly charred by the blazing fire of a jet-pack. And it's all because of PilotWings Resort. 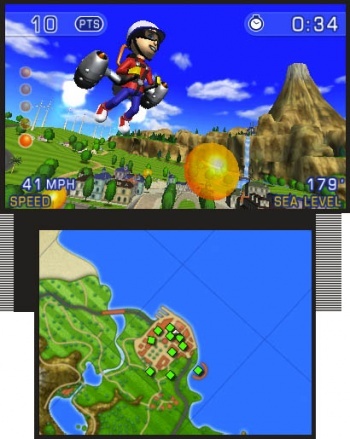 PilotWings Resort is the third game in the PilotWings series that has previously been seen on the SNES and N64. Players once again engage in various airborne missions, but this time they all revolve around Wuhu. You may want to change those vacation plans, because Wuhu Island will soon be populated by thousands of amateur aviators. The game includes 30 total missions that put players in control of a plane, jet-pack, or hang glider. The five difficulty levels from "Tutorial" to "Platinum" include six missions each. Early on, players might be tasked to fly a plane through rings, take photos of a lighthouse while hang gliding, or pop balloons with a jet-pack. Later, the missions vary, requiring players to shoot targets in the plane or complete other tasks. There's also a Free Flight mode where players can just fly around taking pictures or exploring Wuhu's sinister depths (they're not really sinister). This is similar to the mode from Wii Sports Resort. The plane, jet-pack, and hang glider all control completely differently. The plane can bank and twirl while boosting through the air. The jet-pack definitely takes getting used to, with players having to control downward, forward and backward thrusts to move around. I had the most trouble with the hang glider, which requires flying over thermal jets to keep from falling into the ocean. Controlling each is a unique challenge that you'll have to master. PilotWings Resort's gameplay is the sort to have players constantly returning to the same mission over and over to get a better ranking, so there could be a bunch of replay value here. Without being able to test out the more challenging missions, I can't say for sure. Nintendo wouldn't say if there are any bonus missions in Resort like those seen in previous PilotWings titles. There's at least some added fun through dioramas that players can collect to check out in 3D later. I'm a little worried about the game's overall challenge level and depth, because Nintendo seemed to be pushing it as a family title, but 30 missions is a decent amount. Hopefully, the game will feature a varied selection of tasks throughout.